Eric Roberts Laithwaite was born in Atherton, Lancashire on 14 June 1921 and died in 1997. During the Second World War he served in the Royal Air Force and then afterwards studied electrical engineering at Manchester University. In 1964 he became professor of heavy electrical engineering at Imperial College, London and he retired from Imperial in 1986. In 1990 he became visiting professor at Sussex University. During his career he authored many books and appeared on television many times. 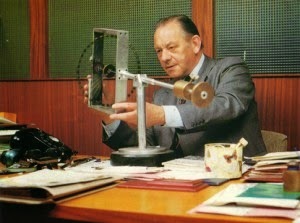 He was a British electrical engineer who went on create the first linear motor. He lodged his first patent for the design of the linear motor in 1956 and this was to become the major achievement of his career. A linear motor is a motor whose horizontal structure creates a magnetic field capable of propelling objects with friction free movement. Friction free movement meant the potential for higher speed movement and lower maintenance costs albeit with high costs for the initial construction. He applied this to railway transportation and in the early 1970s, Laithwaite discovered a new arrangement of magnets, a Magnetic River that allowed a single linear motor to produce both lift and forward thrust. This meant that a magnetic levitation or ‘Maglev’ system could be built with a single set of magnets. The linear motor was perfectly suited for Maglev systems. You can watch a demonstration video from Eric Laithwaite here . In the UK the first commercial Maglev people mover was simply called "Maglev” and officially opened in 1984 near Birmingham on an elevated 600-metre (2,000 ft) section of monorail track between Birmingham International Airport and Birmingham International railway station and travelled at speeds up to 26 mph. Maglev became the basis of many high-speed train projects around the world most notably in Japan. Japan currently operates two independently developed maglev trains. One is HSST by Japan Airlines and the other is SCMaglev run by the Central Japan Railway Company. Recently the vertical transportation industry has been considering how Maglev systems could be used to move elevators side to side in building as well as up and down as illustrated by the diagram of ThyssenKrupp’ s MULTI elevator.